I have been doing some internet research regarding some tricks of the trade to get through being wheelchair bound for weeks, until I can start to bear weight on this silly ankle, or at least get around on a knee scooter. Which by the way is a great invention, but the fine print is that you cannot use one of those until a certain healing point. Like, you cannot be having side-effects due to pain meds in the form of dizziness, or shakiness. You'll fall flat off that little scooter and be in a world of hurt. So depending on your break and what measures they need to take to put you back together again, your resources can be extremely limited. After reading about this, I felt pretty bad about feeling sorry for myself and my situation! I realized that this would be a good time to highlight the importance of helping others out. This is a skill that can be used to tolerate distress, find someone who is in need of something and step out of your own pain and suffering and throw yourself into an act of kindness for someone else, give it try and see how you feel afterward! This invention dropped in my inbox today and brought a little tear to my eye. Do you remember dancing balanced on your dads feet when you were a child or maybe this is something you did/do with your own child? 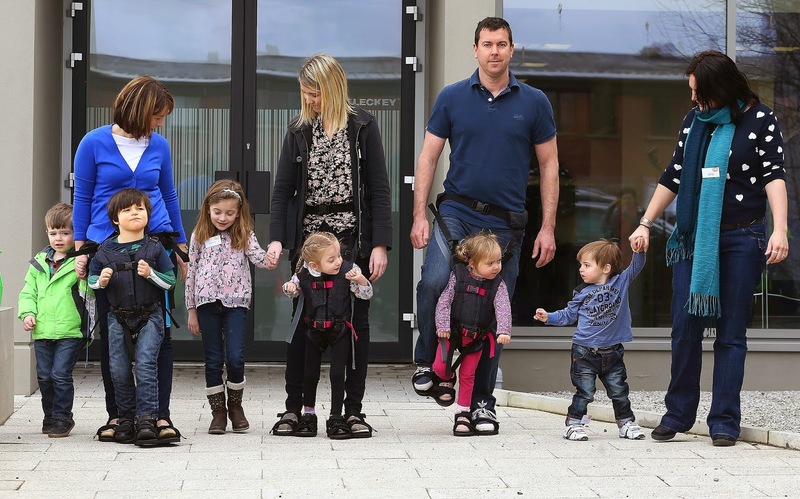 The Firefly Upsee is a harness that allows a child in a wheelchair to be supported upright and feel the motion of walking. Winter is on its way out!